3632 Compressor, Studio compressor from Alesis. 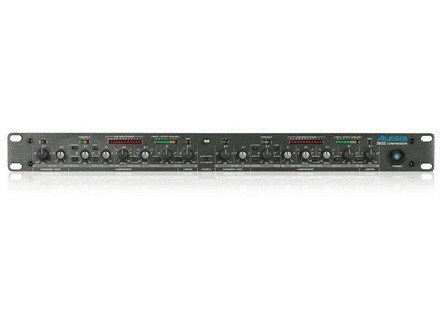 Alesis announces the 3632 Compressor, a dual-channel compressor, limiter, and gate unit. The 3632 Compressor builds on the 3630’s design and features. The single rack-space unit provides two independent compressor and limiter units. The 3632’s compressor attack and release times can be automatically set dependent on the source material, or manual control can be exercised. The unit can function as either two separate processors, or stereo linked to provide true stereo compression. An adjustable expander/gate and very low distortion Voltage Control Amplifiers (VCA) is designed to deliver "smooth sound." A sidechain function is designed to enable users to place the 3632 Compressor in an external effects loop, while a second, internal sidechain employs a switchable low-cut filter to help control pumping due to heavy low-frequency content. LED meters on each channel display gain reduction and input/output levels. The 3632 Compressor will be available from musical instrument and professional audio retailers in Q3 2011. [Musikmesse] Vermona Filter Lancet At the MusikMesse, Vermona are unveiling the new Filter Lancet. Harrison Consoles 950m The Harrison 950m sports an analog design incorporating modular design elements found across a range of older Harrison console such as the 32 Series, MR Series (2, 3, 4, 5 and 7), SeriesTen, SeriesTwelve, MPC and LPC.